Proprietary Name: Tums Chewy Bites What is the Proprietary Name? Non-Proprietary Name: Calcium Carbonate What is the Non-Proprietary Name? Tums Chewy Bites with NDC 0135-0631 is a a human over the counter drug product labeled by Glaxosmithkline Consumer Healthcare Holdings (us) Llc. 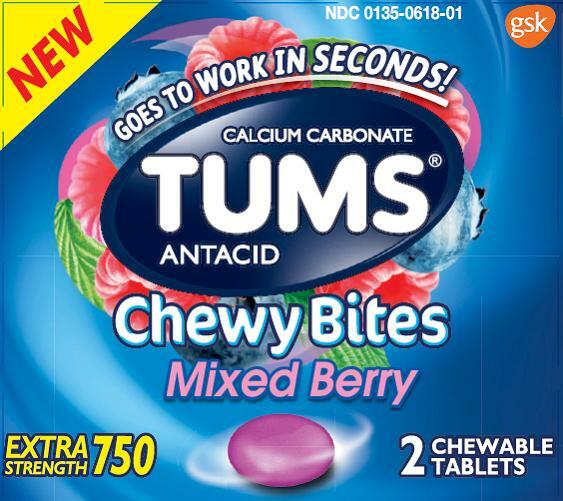 The generic name of Tums Chewy Bites is calcium carbonate. The product's dosage form is tablet, chewable and is administered via oral form. Dosage Form: Tablet, Chewable - A solid dosage form containing medicinal substances with or without suitable diluents that is intended to be chewed, producing a pleasant tasting residue in the oral cavity that is easily swallowed and does not leave a bitter or unpleasant after-taste. FDA Application Number: part331 What is the FDA Application Number? Presently taking a prescription drug. Antacids may interact with certain prescription drugs.